The Calgary region’s first major speculative industrial development since 2015 is a clear sign the city has come out of its economic doldrums and is on the path of recovery, its backers say. 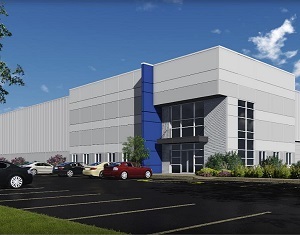 Bentall Kennedy, partnering with the Highfield Investment Group and Hillwood, is moving forward on a 400,000-square-foot facility in Balzac, situated in Rocky View County just north of Calgary’s city limits. The building will be located at the High Plains Industrial Park. Construction will likely begin within the next 45 days and the building will be ready for tenant fixturing by July 2018. “This is a real statement of confidence in the long-term vitality of the Calgary market,” Iain Ferguson, executive vice-president of CBRE, who is leading the marketing of the project to potential tenants, said in a statement. “In recent years, the Calgary industrial market has grappled with the challenge of large amounts of new supply being delivered at the same time when tenants became increasingly hesitant to move due to the oil and gas downturn. “However, tenant activity has roared back in Q2 2017 with absorption, the commercial real estate industries’ measure of tenant demand, back to levels consistent to the pre-downturn era. He said there has been no new supply of industrial space of note over the past two years and the High Plains facility will come onto the market at a time when availability rates are falling. There is also a shortage of modern buildings to meet the increasing demands of tenants and their distribution needs. According to CBRE data, Calgary’s industrial availability rate peaked in the second quarter of 2016 at 9.8 per cent, but fell to 9.3 per cent in Q2 2017 with a positive 584,000 square feet of net absorption. There is only 357,000 square feet of industrial buildings currently under construction. CBRE says tenants are expected to take up between 1.3 to 1.8 million square feet of space in 2017 with the availability rate expected to drop below seven per cent by 2018. Adrian Munro, president of Highfield Investment Group, said the decision to build the facility reflects the company’s confidence in the long-term outlook of the Greater Calgary Area market and the company’s appetite to increase its asset base in the city. “Calgary continues to evolve as a leading logistics hub in Western Canada with the effect of e-commerce driving this evolution. From 2018 onwards, we believe there will be a dearth of available buildings that meet the specialized requirements of retailers’ growing e-commerce fulfillment needs. “Today’s retailers need high clear heights, dual loading and a large power supply to support future automation, all of which our facility will provide,” he said in a statement. According to Statistics Canada, e-commerce sales in the country grew by 39.5 per cent between 2012 and 2015, jumping from $8.3 billion to $11.5 billion. CBRE said Balzac has attracted seven of the 10 largest industrial lease transactions in the Calgary region in the last three years, totalling almost 3.5 million square feet of space. Balzac has easy access to the Queen Elizabeth II Highway that goes north to Edmonton and Stoney Trail, which is Calgary’s ring road. It is also located near the Calgary International Airport. Over the years, the area has attracted major warehouse/distribution centres such as Walmart, Sobey’s and Gordon Food Service. Also, CN’s Calgary Logistics Park is located just south and east of Balzac in the Conrich area of Rocky View County. “Rocky View County’s role as Western Canada’s hub for warehousing and logistics is truly remarkable,” says David Kalinchuk, the county’s economic development manager. “The land owners, developers and brokers in Balzac have done an amazing job attracting major corporations and facilitating major deals. This spec-building is a progressive and optimistic investment in Alberta’s future.